Until recently I had never been a fan of IPython but with their HTML notebook they’ve finally won me over. What I like about this tool is that it makes it easy to go back and forth between interactive prototyping and a script. Being able to continuously edit and re-run code in an interactive session is a powerful tool. The notebook also makes a great tutorial and demo tool. Here’s a PDF of my session developing a Python replacement for IDL’s GAUSSFIT function. This will launch the IPython notebook dashboard in your default browser, from which you can make new notebooks or resume working on existing ones. See the docs for all you can do with the notebook, and enjoy! 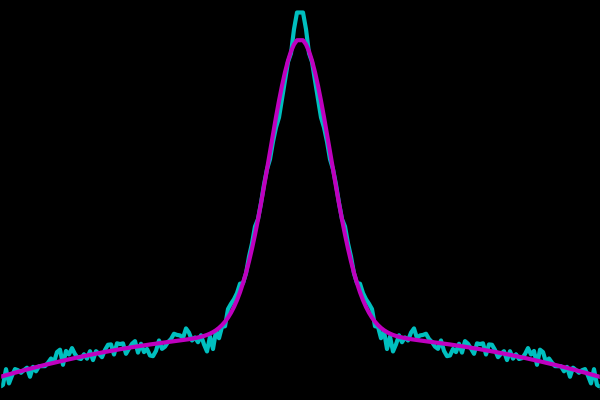 Cyan shows the original data, magenta shows the function fit with parameters returned by curve_fit. Reading tables is a pretty common thing to do and there are a number of ways to read tables besides writing a read function yourself. That’s not to say these are magic bullets. Every table is different and can have its own eccentricities. If you find yourself reading the same type of quirky file over and over again it could be worth your effort to write your own reader that does things just the way you like. That said, here are some other options.